San Francisco for the holidays doesn’t get any better! So if you are in the city this holiday season, you might want to check out the following things to do, see, eat or drink. The [usually] mild weather lends the opportunity to do a lot more outdoors things and take in more of the gorgeous city! 2017 marks the 5th year for the Illuminate SF Festival of Light. The festival includes artist talks, museum tours, and light art activations throughout the city between Thanksgiving and New Year’s. For more specific dates, locations and activities, check out their website. Winter Walk SF is an open plaza in the heart of Union Square. Until New Year’s Day, two blocks of Stockton Street are open for winter merriment including a nightly light art show, caroling, Ghirardelli chocolate samples and Off the Grid food trucks. 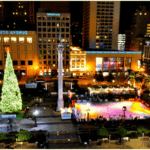 > San Francisco has three downtown ice skating rinks (Union Square, Embarcadero Center and Yerba Buena Gardens) and they are open during the holiday season and on Christmas Day! 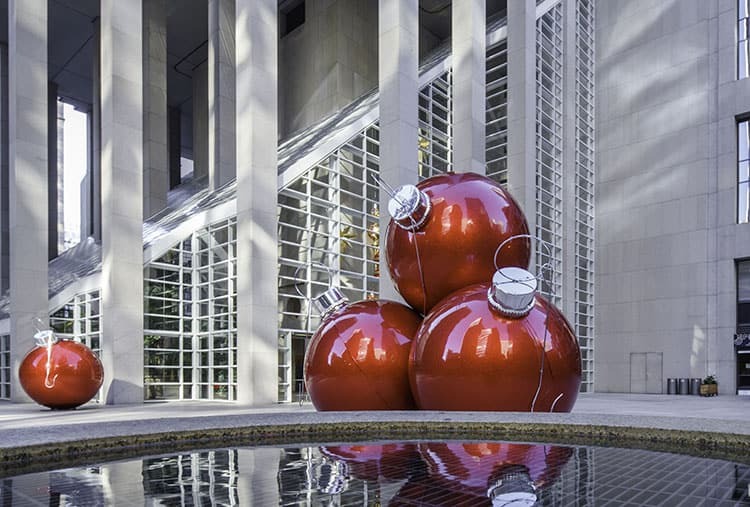 Combine two holiday treats – chocolate and holiday lights on a downtown walk from Gourmet Walks. 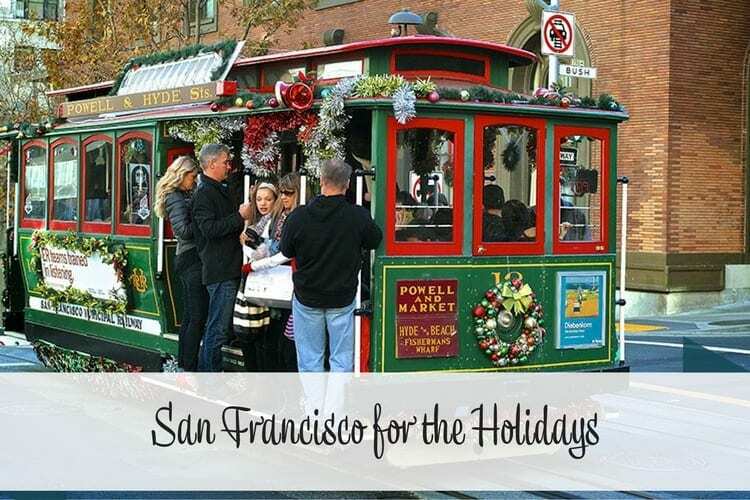 There are seven stops (each with its own chocolate tasting) plus the added bonus of seeing the holidays lights in Union Square, Embarcadero Center, the Palace Hotel and Westfield San Francisco Centre. San Francisco Zoo hosts the Reindeer Romp through New Years, open on Christmas Day as well. Golden Gate Park’s Botanical Gardens is free to the public on Christmas Day. You can visit the 55 acres taking in over 8,000 species of plants and the wild San Franciscans! San Francisco has numerous hotels that are historically fascinating and visually stunning. Add in the holidays and not only are they great places to stay but destinations to visit! > Go for the giant gingerbread house and tea with Santa but stay for one of the Palace Hotel’s six brunch seatings on Christmas Day, in either the Grand Ballroom or the fabulous 19th century Garden Court. > The Fairmont in Nob Hill has a giant gingerbread house made with thousands of ginger bricks baked by the hotel and displayed in the main lobby. > This holiday show at the Ritz-Carlton stars an entertaining elf and his animated helper. And includes a giant teddy bear that every child can have a photo with! The show is for a good cause as a portion of the proceeds goes to the Make-A-Wish Foundation. The best part! San Francisco is a city for food lovers – eating here any time of year is a joy. But there are two seasonal delights that you shouldn’t miss! At Fisherman’s Wharf check out the Franciscan Crab Restaurant, which serves crab with a garlicky, buttery sauce. Or the Crab House at Pier 39, where the crab is served on a hot skillet. A little outside the wharf is Scoma’s a family-owned that has been around for 50 years. They are known for their Crab Louis salad. 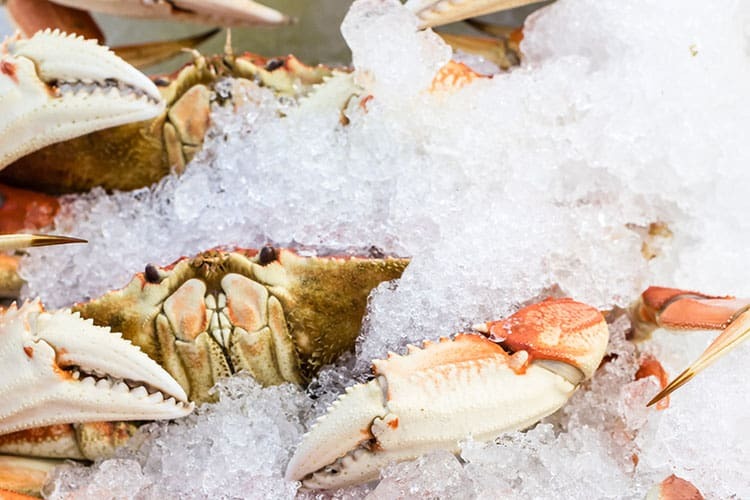 On the Embarcadero, head to The Waterbar which has fantastic seafood platters with fresh crab and oysters! In the Financial District ,you have to visit San Francisco’s oldest restaurant, Tadich Grill which has amazing ciopinno with big chunks of delicious crab – add a classic martini and you are golden! Lastly ,in Chinatown don’t miss R&G Lounge which whips up an excellent salt and pepper crab. 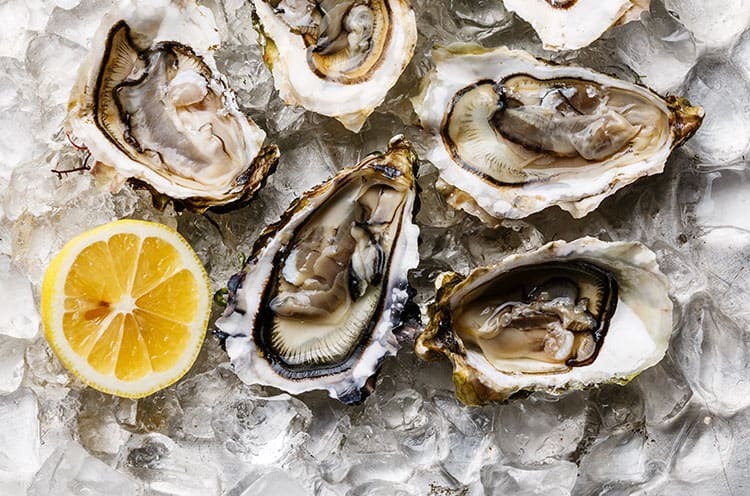 San Francisco has an amazing variety of oysters available at this time of year. The French love oysters for the holidays and its a habit I picked up when Mr. Misadventures and I lived in France. There are a ton of places that have oyster happy hours as well as full meals, I’ve shared my 5 favorite oyster spots in another post you can find here. La Palma Mexica-tessen, 2884 24th Street at Bryant. La Espiga de Oro, 2916 24th Street at Alabama. La Oaxaqueña, 2128 Mission Street, between 17th and 18th. There are a few other spots around the city with good tamales. I like the ones at Traci Des Jardins’ Mijita in The Ferry Building. And Alicia’s Tamales Los Mayas in Justin Herman Plaza at the Embarcadero. Given San Francisco’s weather, the holiday season can be pretty mild but you should always be wary of fog and winds, which can quickly put a chill in the air. Here are a few places to seek warm refuge and unique drinks in case a cold front hits. 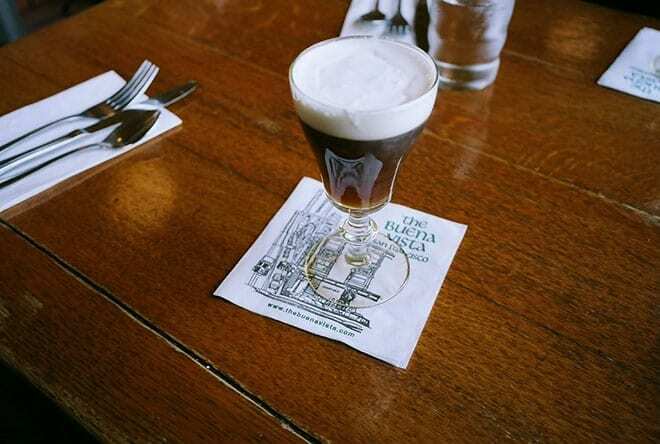 The Irish Coffee at the Buena Vista Café is a San Francisco classic. The cafe has a special method of aging and frothing the cream so that it floats on top of the coffee dating back to 1952. A special holiday treat, one of the best in the city is served at Smuggler’s Cove in Hayes Valley. It is the best because they focus on one thing, rum. There are more than 400 varieties in this a unique spot that is devoted entirely to rum. Their hot buttered rum prepared with demerara rum and a secret spice mix, it is truly something special! My grandfather used to make me hot toddies if I was ever sick while visiting my grandparents and it holds a special and nostalgic place in my heart. My pick for hot toddies in San Francisco is Elixir in the Mission district. A dive bar that serves more than 330 different whiskeys, your hot toddy can take on vanilla notes or a serious peaty flavor, depending on what you choose. For European hot chocolate head to the Ferry Building and try out the decadent chocolate that Boulette’s Larder serves straight out of a copper kettle. For Mexican hot chocolate add a cup to your tamale order from La Oaxaqueña, theirs is made with ground almonds, and a pinch of guajillo chili powder for that addictive burn. Every holiday season the 101 California building puts out giant Christmas ornaments on the backside of their building (on California Street) it is right next to Michael Mina’s Japanese restaurant Pabu and the less expensive (but very yummy) The Ramen Bar. After photos and lunch head up the street one block to catch the cable car. Dimsum is a great holiday meal, especially good for big groups of family or friends. Here is my San Francisco Bay Area Dimsum Guide. Visiting the Sunset District, here’s my guide. Visiting the Mission District, here’s my guide. Visiting Nob Hill, here’s my guide. Visiting the Financial District, here’s my guide. Visiting the Richmond District, here’s my guide. Visiting Lower Haight, here’s my guide. Visiting SoMa, here’s my guide. Visiting the Marina, here’s my guide. Visiting North Beach, here’s my guide. Visiting Hayes Valley, here’s my guide. 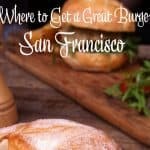 Here are my San Francisco restaurant posts. How about you? What would you add? 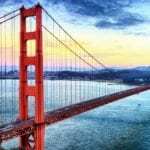 See my entire collection of San Francisco post in my San Francisco Guide. Also, you can save 42% off admission to the best San Francisco attractions with a San Francisco CityPASS. PLUS, skip most tickets lines! This post contains affiliate links. If you click through and make a purchase, I may receive a commission (at no additional cost to you). Thanks for your support! Wonderful list. I want all the crab. Save me a hot toddy too, K thanks. @Colleen, it is embarrassing how much crab I have been eating lately! @Myrabev, I hope you visit one day. The absolute best months are September and October! @Heather, it is very pretty and so easy to get around! there are definitely a handful of things i would love to try on this list!! i keep hearing about the SF zoo lately. I don’t know why I never thought to go before. then again.. i used to go to SF every year for about the last decade, but we haven’t done as many touristy things in SF until more recently. @Esther, the zoo has had its ups and downs. It is a nice zoo but there are great zoos in other cities. There have been some tragedies around the SF zoo which is why you have been hearing about it! San Francisco during the holidays is great! Wow! I guess I’d better plan a vacation to SF! Would so love to visit San Fran again! And around the Holidays sounds amazing! Great list. I went to San Fran years ago, my daughter wants to go so hopefully we can go at some point. Wow! This is a great list! Thanks for sharing. Great list! I’ve heard about SF during Christmas time quite a bit this year. It might have to make an appearance on the bucket list:). @Tanya, most definitely, but any time of year is great! Andi, this is such a fabulous round-up of options! Clearly, any out-of-town guests must love having you be their host! I think the Winter Walk is a great seasonal thing, and the seafood splurge is one of my fav things to do as well. I already hit up R&G a few times for their salt and pepper goodness. 😉 Happy holidays!! @Lauriel, yes, you cannot miss R&G at this time of year! LOVE San Francisco…. now I’m yearning for that hot chocolate. @Barbara, it is hard to resist! In depth and yummy guide! I am overdue for a trip to San Fran. Have never been during the Holidays! @Nadeen, it is a great time to come! That hot buttered rum sounds AWESOME. In my head, it tastes something like a good Werther’s Original candy. Either way, I’ll bet it’s tasty. @David, it is a little like that with a major alcohol kick in the pants! Great list. I enjoyed Tadich Grill. The Buena Vista Cafe was very cozy and the drinks were yummy. It can get crowded at times, be prepared to wait a bit. If you’re staying in downtown, I recommend taking the cable car as it stops at the corner of the cafe. It’s a furn ride. @Ash, cable cars are so fun! They were broke down the day after Christmas which wasn’t cool because they had buses as a substitute and that is NOT the same feeling – trust me! I love this list, Andi. San Fran is one of my favourite cities in America. I think all Australians who have visited have a fondness for it! My favourite experiences there were Greens Restaurant down at Fort Mason (I think that’s the area…) and Soul Groove in the seedy part of the tenderloin area. Soul Groove does chicken and waffles, and vegan chicken and waffles – keeps everyone happy! The Science Academy is fantastic, too. @Jess, Greens is amazing, there are so many vegetarian and vegan options in SF. I work with an Australian who said the same thing! Woah! San Fransisco sounds like a seriously happening place around Christmas time…. well maybe all the time, but that sounds like so much fun! @Michelle, you should definitely check it out! I would love so much to spend even just some of the Christmas holiday in San Fran. It seems like it would be such a great trip! @Alyssa, it truly is magical! This list is awesome. I have never been to San Francisco at the time of a holiday but it sounds amazing. And your pictures are simply gorgeous!!! @Jamie, it is wonderful during the holidays, you should definitely consider visiting! 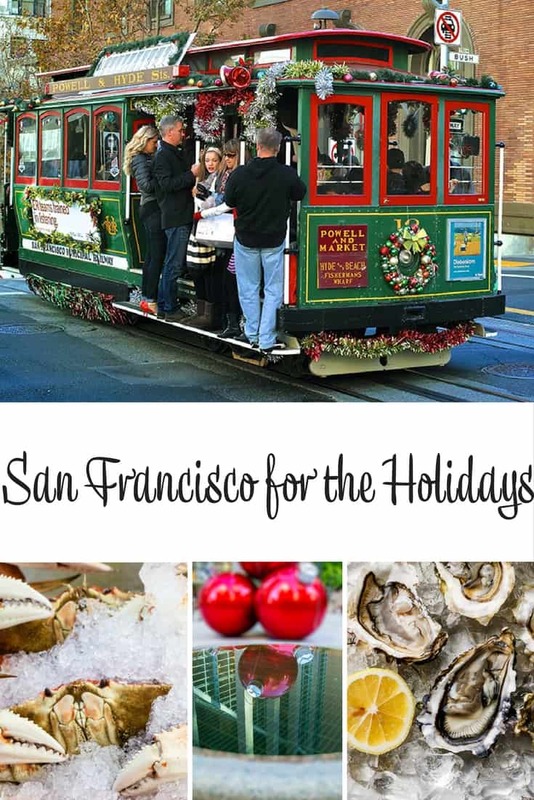 We love San Fran and your post had inspired us to visit during the holidays one day; crab season is definitely inviting! @Kelly, definitely do, SF is wonderful this time of year! It sounds like there are a lot of fun things to do in San Francisco for the holidays. We have a lot of things going on in our city too. @Risa, what is your city up to during the holidays? FYI I get a page can’t displayed error on the favorite Christmas traditions post. Lots of fun things to do! I want to visit San Francisco. @Karissa, I hope you get here some day! Any time of year will be fun! If San Francisco is anything like San Diego, I am sure I would love it. I just adore everything about Cali. @Stephanie, it is colder! More hills, but great food and beer like you have in SD! I LOVE SF anytime, so you wouldn’t have to convince me to go during the holidays! Your suggestions sound wonderful! I hope I can make it to SF one December; if I can make it to Germany, then SF doesnt’ seem so hard! @Christina, especially for you being so close by plane! I have wanted to visit San Francisco since I have watched- gulp- should I admit this- Charmed! this is a great list, and I would love to try all the things on it! @Taryn, I watched Charm – no shame here! I’ve never visited San Francisco at all, but I’m sure the holidays are a great time to travel there. The winter walk sounds like something we’d enjoy. Looks so fun,would love to visit one day! @Deb, hope you get here one day, you’ll love it! Awesome. Looks like a very nice place! Looks like a great place to visit and many things to do. What a lovely way to spend the holiday. My in-laws live an hour outside of SF so next year we are going to try and spend Christmas out there. I love San Francisco. My husband and I went to Sonoma, Napa and San Francisco on our honeymoon. I LOVE CRAB FEST IN SF. It’s been too long since I experienced it last. I need to go again. Beautiful pictures. Love the article. Thanks! The crab dish is marvelous. I bet it tastes like heaven. SWOON! Fisherman’s Wharf! !I love the city and I am so wanting to go back and visit! We live less than an hour away from San Francisco and I just do not make it up there often enough! San Francisco is definitely on my bucket list. My boss went over the Summer and his photos were awesome! I also have a friend there I would love to see. My son was just talking about going to S.F. my dad lived there years ago and he wants to check it out. It looks like a fun time there for sure. All of your posts make me want to travel non-stop, naturally. What a beautiful picture of the city. I think I will just more here for all of the crab,lol! I’ve never been to SF but I’d love to go someday. One of these days I will visit San Francisco. Would love to visit San Francisco one day and it sounds like there are a lot of things to see. do and great food too. I’ve always wanted to go to San Francisco. That food looks fabulous! I love how detailed this post is. Thanks for sharing about your travels. I am going to LA in February, so I’m excited to post about my own experience traveling to California for the first time as well. Your post has me even more excited about it! @Julia, oh LA, so much to eat there! My favorite thing so far, and it is so silly is a chocolate shake with whiskey at 25 degrees in the Roosevelt hotel! I can’t wait to get to San Fran someday! Your post has me super jelly now! Have always wanted to go to San Francisco and to go for the Holidays would be a dream come true.